A poster for the 2014 film "Interstellar," whose Blu-Ray edition hits stores on March 31, 2015. 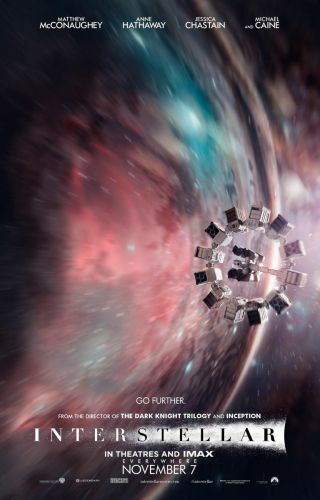 The film "Interstellar" is big and epic, and so is its upcoming Blu-Ray edition. The three-disc "Interstellar" Blu-Ray Combo Pack, which hits stores March 31, contains an HD version of the film and three hours of bonus content, including in-depth looks at the spacesuits, spaceships and robots featured in the film, and tours of the meticulously contructed sets. The Blu-Ray version will retail for $39.99. A single-disc DVD edition, which will also be released on March 31, will retail for $29.99. The DVD includes "Interstellar" in standard definition, without the special features, according to Paramount Pictures. "Interstellar," which was released in theaters throughout the United States on Nov. 7, is set in the not-too-distant future, when global crop failures are threatening humanity's survival on Earth. A small group of explorers, led by a former farmer named Cooper (played by Matthew McConaughey), heads out on an intergalactic voyage — made possible by a wormhole that mysteriously appeared near Saturn — to find a new planet to call home. The film also stars Anne Hathaway, Jessica Chastain and Michael Caine, among others. You can order the Blu-Ray or DVD edition of "Interstellar" at Amazon.com.